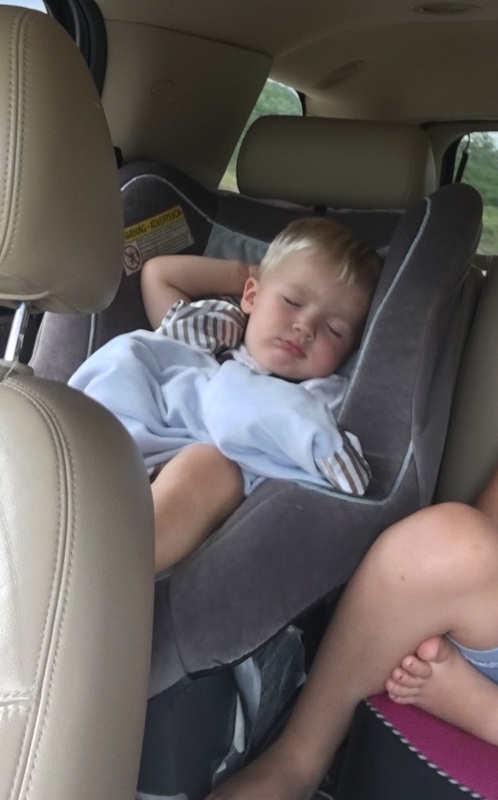 While my girls were at their grandparents having a great time last week, I made the most of having just one child and went on three small road trips. Wednesday I had a precious girl from church who had offered to babysit Will Holden so while she kept him for a few hours, I went to Siloam Springs ( a town about 30 min away). Scott works in Siloam so we had a rare lunch date. His office had given him a gift card to 28 Springs for Christmas and we had never had time to use so we went. It was delicious. We had crawfish beignets that were DIVINE. And Scott had chicken and waffles. I had a sandwich that was delicious! Siloam Springs is a small town in NWA but it's really neat. Their downtown has come a long way and has a lot of cute restaurants and shops. I've already made Laurie promise me that this fall when the kids are all in school - we can go have a "Siloam Springs" day. The other reason I wanted to go was our kids at church went to camp at Camp Siloam. I grew up going to Camp Siloam and worked there all through college. It's a special place to me so since some of my best friends were there as counselors - it gave me a great excuse to go visit them! I picked up Sonic drinks (or manna from heaven for those poor counselors) and went to see my friends. This is the dining hall. It's a million years old and there is a tree growing up through the middle of it. They are tearing it down after this year and building a new one. It's SO well needed but man I'm so nostalgic about this dining hall. I have so many good memories in that place. The worship center. It was built in 1991 - the first year I worked at camp. Before that we met in a an open pavilion. Brandi and Ashley. Our church had a rough week at camp - lots of crying kids and LOTS of throwing up. And it was as hot as the surface of the sun. Bless these counselors! These are some of my best friends - I love these girls. Thursday Laurie and I headed to Grove, OK. It's about an hour away from where we live. I had had a lady there make me a sign for my kitchen. Our friend Maegan's family has a lake house in Grove and we had driven through there recently and Laurie and I thought it looked like such a great town so we were excited to have the chance to go. We had Sarah Kate with us and Will Holden was in MDO. It was a quick trip but we picked up my sign (I will show you later this week) and we ate at Charlie's Chicken. Laurie loves that place and it was worth the trip for her to eat there. We went to a couple of little stores and I got the sign above for Will Holden's room. We loved Grove. Laurie and I love to dream up moving our families to different places. We love Bentonville but sometimes we just miss small town life. I've just about convinced Scott to move to Grove - we just aren't sure what he would do for a job. ha! But it's fun to think about. Friday, Will Holden and I drove and met Scott's parents a little less than halfway to pick up the girls. We met them for lunch and then headed home. He finally passed out when we were almost home. He was SOOOO happy to see his sisters and so was I ! So glad to have all my monkeys back in one place. Our house is extremely loud again but that's the way it should be. This sweet boy. I am so crazy about him. He is so busy and crazy and makes me exhausted but he's the sweetest, cuddly, funniest boy. What a gift. And how cute is he in this outfit? And these girls. Why do they look so grown up? They are my delight. Our pastor is on an 8 week sabbatical this summer and he asked my dad to preach for him this Sunday. It was a little bit like my worlds were colliding to have my dad preach at my church. It's like when your college and high school friends meet at a party. Or work friends and church friends. It was great and very special. They were camping in Bella Vista so we went out to see them this afternoon and walked down to the creek near them. The girls ended up spending the night with them in the camper. Will Holden loved this cold spring water. We only have 7 weeks of summer left. I was kind of dreading summer thinking it would be hard with everyone home but it's been really a lot of fun. And it's going too fast!